Combo Lamp Head and Exit Signs meet code and make a difference. This lighted Exit sign features two side lamps for visibility. • Battery Backup comes standard with this model. • A Universal Canopy is included. • Exit sign includes universal knockout chevrons. • Dimensions include emergency lighting. • Add 3.3 pounds to the weight of this item with the Remote Capability option. • Purchase additional remote heads for this unit. • Our Best-Selling Combination Exit Sign offers a distinctive, thermoplastic shell and a fully self-contained sign. A universal mounting canopy is standard, allowing for versatile installation options. • This sign uses less than 4 watts of energy for red letters and less than 5 watts for green letters. The LED lamp will last for 25 years. 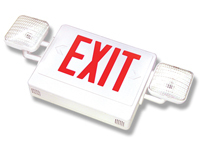 • The Combo Exit Sign includes a push-to-test switch and a 6-volt sealed lead acid battery. It also includes low-voltage disconnect. • Two fully adjustable, glare-free lampheads offer an energy-saving, bright light source in an emergency. Point the lampheads toward an egress point or nearby exit; or, point toward emergency equipment, such as a fire extinguisher. • A self-test/self-diagnostic option is available for this Exit Sign, for continuous self-testing of AC power and your battery source. An LED indicator light will alert you if your power source needs to be examined. • The high-impact, thermoplastic housing is damp location rated. • Knock-out chevrons are included with each sign. You may field install these chevrons. • Exit signs come double-faced as standard. Shipment came in with no damaged products. Have yet to install the lights but will give feedback if we run into any that do not work. Simple to order and high quality for the price. No reason to shop anywhere else for backup lighting or exit signs.